Healthier workers are more productive, have fewer sick days, and have decreased health care costs. Given that many adults spend half their waking hours at work, the workplace can play a big role in supporting positive lifestyle changes. Most workplace wellness efforts have focused on organizational programs and policies. However, jurisdiction-wide policies implemented by state and local governments can also support wellness in the workplace. Workplace wellness does not begin and end at the office door. Employee wellness and community health are fundamentally linked. 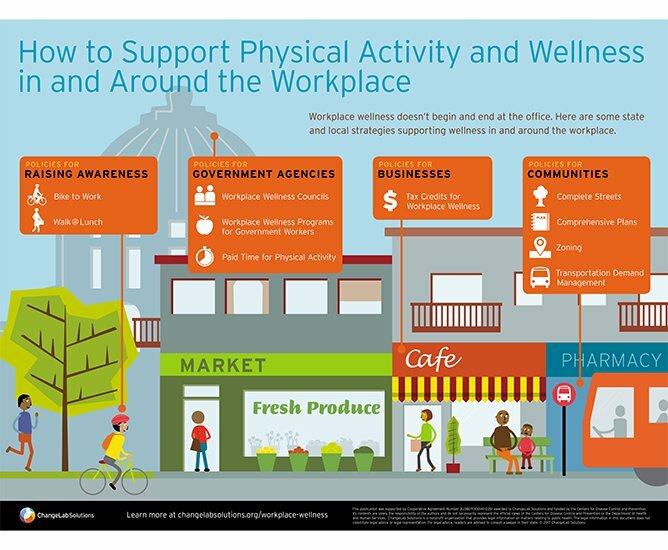 Recognizing this connection between employee health and community health, ChangeLab Solutions developed Walk This Way to outline state and local policies that support physical activity and wellness in and around the workplace. Developed for wellness promoters, including decisionmakers, business leaders, health department staff, and other stakeholders, this resource provides common strategies for supporting workplace wellness. We also offer a companion poster that provides an overview of some state and local strategies supporting wellness, and a comic, The Story of Alex & Riley, which explains why the policies included in this resource are relevant to us all. Be sure to download all 3 resources below! This publication was supported by Cooperative Agreement Number 3U38OT000141-03S1 awarded to ChangeLab Solutions and funded by the Centers for Disease Control and Prevention. Its contents are solely the responsibility of the authors and do not necessarily represent the official views of the Centers for Disease Control and Prevention or the Department of Health and Human Services.